The wolf is tricked by Red Riding Hood into strangling her grandmother and is subsequently arrested. Sleeping Beauty and Cinderella do not live happily ever after. And the fairies are saucy, angry, and capricious. 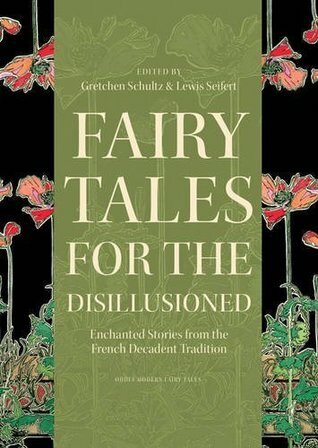 "Fairy Tales for the Disillusioned" collects thirty-six tales, many newly translated, by writers associated with the decadent literary movement, which flourished in France in the late nineteenth century. Written by such creative luminaries as Charles Baudelaire, Anatole France, and Guillaume Apollinaire, these enchanting yet troubling stories reflect the concerns and fascinations of a time of great political, social, and cultural change. Recasting well-known favorites from classic French fairy tales, as well as Arthurian legends and English and German tales, the updated interpretations in this collection allow for more perverse settings and disillusioned perspectives--a trademark style and ethos of the decadent tradition. Fairy Tales for the Disillusioned is an entertaining read that transforms familiar stories and shows them in a new light. Some of my personal favourites included one story in which fairy tale villains make a case for their innocence, and another in which Bluebeard is shown to be the victim of a series of awful wives. Although certain stories appealed to me more than others, their diversity means there should be something to please everyone. Recommended for readers who enjoy a little twist to their fairy tales, and also to those interested in literary history and the French Decadent period.